The new 17,000 m3 Digester 6 at Changi Water Reclamation Plant will be mixed using a custom Rotamix pump and nozzle mixing system. With a diameter of 32 metres across, a sidewall height of 13.9 metres and a cone depth of 18.3 metres, Engineers working on the Digester 6 project at Changi WRP were presented with some unique challenges. One major consideration was selecting a sludge mixing system that would be capable of mixing such a large volume digester and deep cone floor. 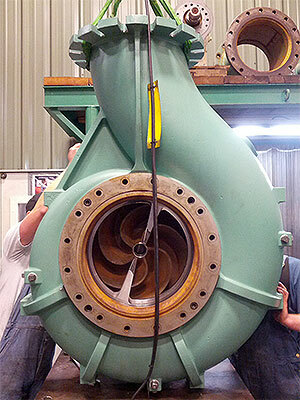 A Rotamix Process Mixing System was the answer. 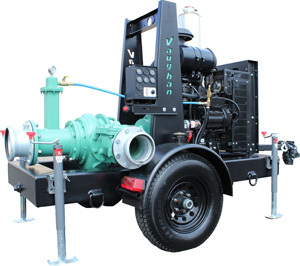 Vaughan Company, Inc., the world’s leading chopper pump manufacturer for over 50 years have released a new heavy-duty, diesel engine driven, vacuum primed chopper pump for mobile solids handling applications. The unit is an adaption of the popular Vaughan model HE6W horizontal end suction chopper pump, designed for handling high concentrations of difficult suspended solids without clogging. With the aid of a robust venturi vacuum prime system, the unit allows for dry suction lifts up to 7.3 metres, flow rates up to 560 cubic metres per hour, and heads up to 40 metres. With the main pump wet end built to the same tried and trusted spec as regular Vaughan chopper pumps, including the heavy-duty bearing housing and “flushless” cartridge seal configuration, end users can be assured of the highest mechanical reliability in the toughest pumping applications. The pump unit has an 8″ suction flange and 6″ discharge and is powered by a top quality four cylinder, four cycle, turbocharged and water cooled John Deere 4045TF290 Interim Tier 4 diesel engine. For full specifications and performance data, please click here. Vaughan Co., the world’s leading manufacturer of chopper pumps for over 50 years is also the producer of the world’s largest chopper pump – the Vaughan model 12W. The 12W, with its 18″ suction and 12″ discharge is capable of flow rates up to around 2200 m3/hr (611 L/s). 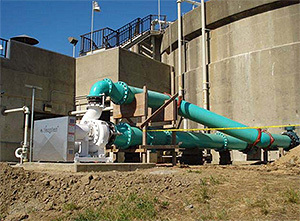 This large pump is commonly used in municipal pump station applications and also for the mixing of high-volume anaerobic digesters and sludge tanks as part of Vaughan’s Rotamix System. As the Vaughan chopper pump is forever proving its value as a reliable and clog-free alternative to conventional solids pumping, Vaughan Co. has recognised the need to expand on its current range and will be releasing an even larger chopper pump to cater for higher flow applications. Due to be released this year, the new Vaughan model 16W will have a 16″ discharge and will be capable of producing flows up to 3,180 m3/hr (approximately 880 L/s). This revolutionary new chopper pump will be available in multiple configurations including dry well and submersible designs, and will be ideal for high flow applications in large local authority pump stations, influent wet wells, wet weather stations and CSO basins among many others. Fairfield-Suisun Sewer District (FSSD) in California installed a Vaughan Rotamix® hydraulic mixing system next to an identical anaerobic digester with a 7-year-old gas mixing system. Rotamix® installation was completed in Sept, 2010. This opportunity allowed the District to directly compare Rotamix vs. gas mixing in their very well instrumented digesters, which handle predominantly primary and thickened waste activated sludge. The digesters are identical 95 ft (29m) dia, 1.76 million gallons (6613 m3) conical floor units. As environmental awareness and resulting laws have come into effect, and as managers seek to increase production efficiency, improved methods for moving debris-laden waste slurries have been needed. Historically this has been accomplished through the use of the “non-clog” pump, where a recessed or open impeller, passes large solids through the pump. However, experience has proven that the name “non-clog” does not mean the pump won’t clog. In many cases, especially where the solids size may be larger than the passages through a non-clog pump or where long stringy materials are present, a more aggressive approach, such as a chopper pump, is needed. Compared with a conventional non-clog pump, a chopper pump is essentially a non-clog pump PLUS a chopper system – that is, two machines in one. Vaughan Rotamix will solve many of the traditional problems associated with mixing storage lagoons at local authority and industrial wastewater treatment plants as no moving parts are installed in the lagoon. Submersible mixers and floating shaft driven mixers have electric cables and moving parts in the wastewater, which can be prone to problems of fine fibres and rags reweaving and wrapping around moving parts, shafts and cables. If an electric motor fails for any reason, this will require the complete mixer to be removed, which in turn will affect the operational aspects of the lagoon. Vaughan Chopper Pumps are used in local authority and industrial recycling plants to solve those difficult pumping applications where solids in suspension cause continual clogging problems with pumps and pipe lines. 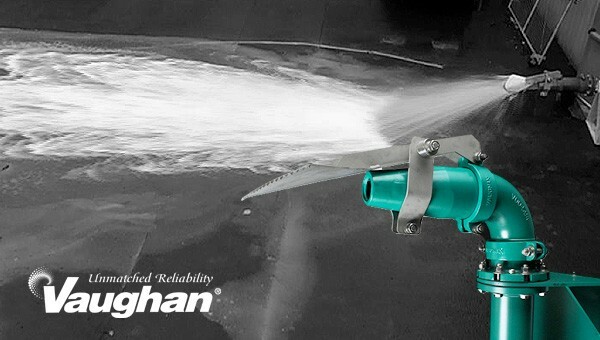 The Vaughan Chopper Pump is not a grinder, macerator or muncher, nor just another non-clog impeller pump. Instead, the Vaughan Chopper Pump features a unique chopping impeller turning across a stationary cutter bar at the suction inlet of the pump, thereby reducing incloming solids before being pumped away as a preconditioned slurry or waste.